Irish biscuit manufacturer East Coast Bakehouse has achieved Origin Green membership. To achieve Origin Green accreditation, East Coast Bakehouse had to show sustainability timelines and targets, which were then verified to an independent standard. Included in the plan were commitments to sustainable sourcing, environmentally friendly operations, and a range of community initiatives. Employing a team of 45 at our Bakehouse in Drogheda, East Coast Bakehouse bake a range of biscuits using Irish butter and Irish Oats and now stocked in all major retailers nationwide. 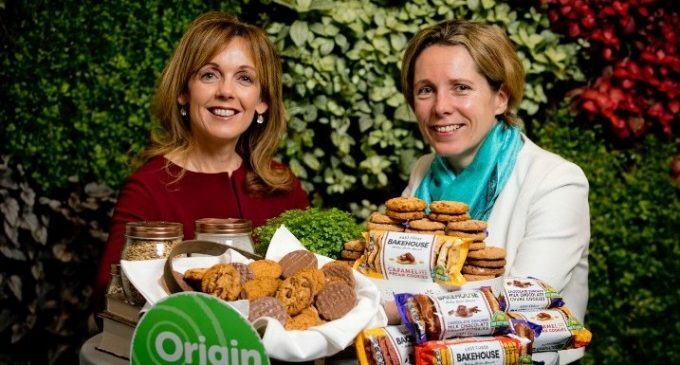 Alison Cowzer, Co-founder of East Coast Bakehouse, and Tara McCarthy, Chief Executive Officer of Bord Bia, announcing East Coast Bakehouse’s Origin Green membership.